As we’re sure you’re aware, the holiday season is right at our doorstep. As the air cools down just a little bit, shopping centers are beginning to put up their red and green decorations, and families are sending out invitations to their parties and preparing for the arrival of relatives. If you’re wondering about the best gift to give your family this holiday season, we’d love to suggest getting a dog. Dogs can help your children learn responsibility. Maybe your parents got you a pet when you were growing up to help you understand responsibility, too. While dogs are a lot of fun, they also require a lot of care and attention to help them thrive. You can put your children in charge of daily dog duties, like taking them for a walk and making sure they get the right amount of human grade dog food for dinner. Dogs can help everyone learn a little patience. Sometimes the training phase can be frustrating when bringing a new dog into the house. By working with your new furry friend through these issues, you’ll learn to be more patient and to work through issues instead of giving up. This isn’t just beneficial for the little ones - we can all do with a little more patience as we help our dogs grow happy and healthy. Dogs are the best stress relievers. Coming home after a long day at the office? Are your children stressed about upcoming exams? Just take a little break to play with your pup! Studies have shown that even something as simple as petting a dog can take a load of stress off your plate. High stress can lead to physical illness, so having a dog around the house can keep everyone happy and healthy. The team at Pawsitively Pure advocates adoption when you’re looking for a new family friend. Now that Florida has passed Amendment 13, outlawing greyhound racing, there are soon to be a number of dogs looking for their forever homes. Check with your local shelter or rescue program to find out more. To order your Pawsitively Pure food, bone broth, and treats, click here, or find us on Facebook! Did you know that October is National Pet Wellness Month? After the excitement of the summer, the fall is the perfect time to slow down and give your pet an overall health and wellness checkup. 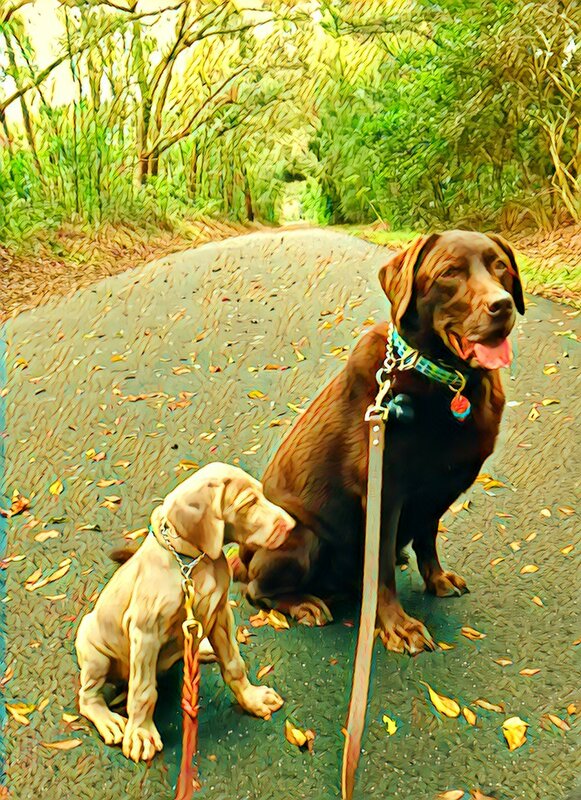 Here at Pawsitively Pure, we like to treat Pet Wellness month as a new beginning for our pets’ health goals and find new ways to improve quality of life for Jackson and Finley as they grow older together. Make sure your pups are following healthy, balanced diets. The number one thing you can do to keep your pup happy is to ensure the food they eat is fresh and free from unnecessary fillers and sugars. The best way to do this is with whole, human-grade foods. Your dog wasn’t designed to live on kibble; make the switch to natural food and you’ll see increased energy levels and much more alertness in your pup. Give your dog an enriching environment. No matter how often you try to give your dog outdoor playtime, they’re still spending most of their lives inside the house. Make sure your dog isn’t bored and provide him with a variety of toys and puzzles. Also, as often as possible, take your dog on different routes for your daily walk. Any training sessions are also great opportunities for both enrichment and bonding. Give your dog an at-home wellness checkup. Your dog can’t tell you when he’s experiencing a health issue; instead, you have to rely on your own observations to discern that your pup is under the weather. Usually, by the time symptoms get serious, the issue has been present for a while. This is why it’s so important to regularly give your pet a simple at-home examination from tip to tail. Here’s a great guide from Healthy Pets by Mercola. Give your pup a little extra love for National Pet Wellness month! If you’re not sure where to start, your pet’s diet is the biggest factor in their overall health and wellness. Review your food and treat choices and determine what areas might need a little extra healthy nutrition. When you’re ready to switch your dog to natural, human-grade food, click here to shop Pawsitively Pure’s products. Treats are an important part of every dog’s diet! Not only do they give you a way to reward good behavior and train further good habits, they allow you to beef up your pet’s nutrition as long as you make healthy choices. From training treats to larger chewables and bones, treats can keep your dog busy, strengthen their gums and teeth, and reinforce positive behavior at home and on the go. Include real vegetables, like carrots, green beans, or broccoli, for a healthy crunch and pure nutrition. On a hot day, many dogs love chewing on a handful of frozen veggies to cool down. Before you go to the fridge, though, make sure the fruits or vegetables you choose are not toxic to dogs. Onions, grapes, avocado, and chocolate are at the top of the do-not-feed list. Be careful when giving your dog bones to chew on. If you want to give your dog a real bone to gnaw on, make sure it’s a raw, meaty bone like a turkey neck. Cooked bones become brittle and can splinter easily, causing a choking hazard. Some bones, like antlers, may be too hard for your dog’s teeth and can cause cracking. Pay attention to your dog’s reaction to their treats and always supervise snacking. Choosing the right treats for your dog should be fun and exciting. When you have a handful of flavors to choose from, you can pick out the one that makes your pup’s tail wag the hardest. Even picky eaters love Pawsitively Pure cookies. To learn more or to shop for your favorites, click here. If you’re a dog owner, you’ve probably experienced your fair share of halitosis coming from your furry friend. Yes, we love our pups, bad breath and all; but whether you realized it or not, bad breath doesn’t have to be the default for dogs. 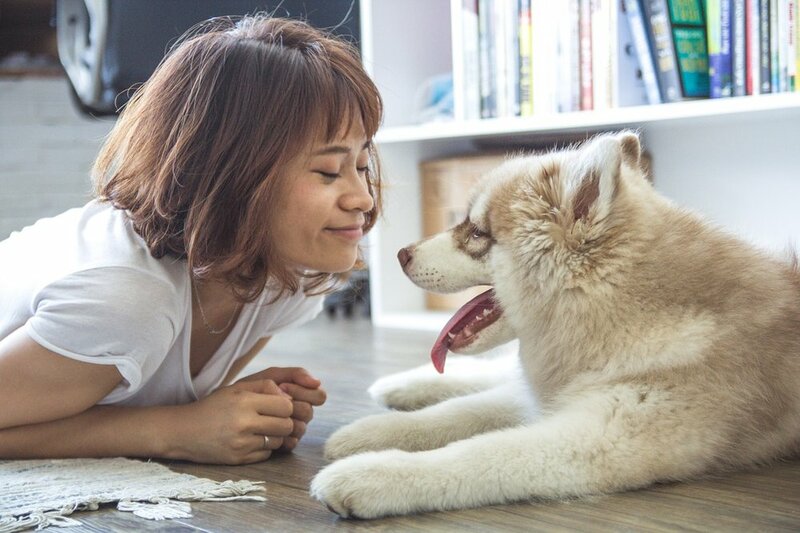 While your pup may never have minty-fresh breath, severe halitosis and odor from the gums and teeth may be a sign of a health issue that can develop into something bigger if left unchecked. No added sugars. Just like processed human foods, processed kibble tends to include a lot of sugar-based fillers to make it more appealing and preserve it for longer. All that extra sugar leads to buildup and tooth decay - yes, just like it does to humans! Reducing the amount of sugars in your dog’s diet can be a huge helper in staving off plaque and freshening their breath. It includes tooth-protecting enzymes and nutrients. The nutrients found in fatty acids, COq10, and folic acid, have been shown to strengthen gum tissue and help stave off periodontitis. Our bone broth and dog food are chock full of healthy ingredients including these nutrients, leaving your pup with a more comfortable mouth. It makes it easier to add in supplements. If you have a picky dog, you’ve probably gone through the struggle of trying to add supplements to their kibble, only to have them pick around it. Flavorful bone broth is a great way to disguise additional supplements in your pup’s food and can blend completely so they can’t pick around it. They may even learn to love their supplements in time! While oral health isn’t always at the forefront of a dog owner’s mind, it’s an important part of your dog’s overall wellness. Keeping the teeth and gums strong can help dogs lead active lifestyles and keep their body safe from other infections. To learn more or to browse through our human-grade dog products, click here. Want to know where else you can find Pawsitively Pure? Check out our blog here! Where Can I Find Pawsitively Pure Dog Food? If you’ve been keeping up with Pawsitively Pure on our social media accounts, you’ve probably seen that we’ve been out and about in Orlando! We love how dog-friendly our hometown is and try to attend as many pawtastic events in the area that we can find. From farmer’s markets to dog washing parties, we love to see wagging tails and give pups and their parents the chance to try natural, healthy food. Maitland Farmers Market: Pawsitively Pure dog food often has a tent set up at the Maitland Farmers Market on Lake Lily. This is one of the most dog-friendly farmers markets in Orlando! Bring your furry friends, try a few treats, and take a leisurely stroll around the lake. Oviedo Farmers Market: Every first Saturday of the month, the City of Oviedo hosts a farmers market at historical Lawton House. Find us there and get some special treats for the holiday season! 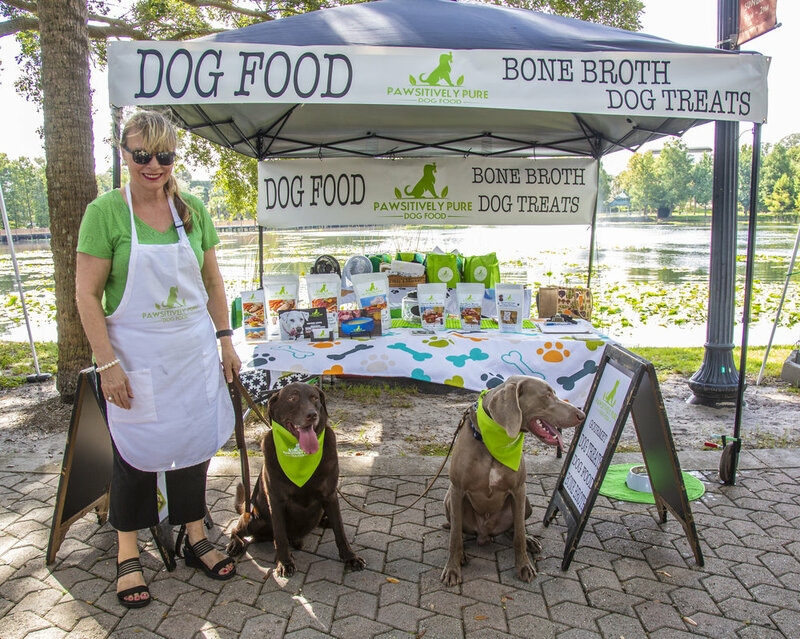 Lake Mary Farmers Market: Starting in Mid-November, Pawsitively Pure will be joining the Lake Mary Farmers Market. This is another fantastic dog-friendly outdoor market that features loads of wonderful handmade goods and pet supplies. Make a day of it and join us one Saturday when the weather starts to cool down! Integrative Animal Hospital of Sanford: Our food and treats are carried at IAHCF in Sanford, FL! Their physicians recommend our healthy ingredients as part of your pup’s balanced diet. 7th Annual FLDR Wienerfest: What better way to celebrate Oktoberfest than with some wieners - wiener dogs, that is! Florida Dachshund Rescue is hosting their 7th annual Wienerfest on October 20 at Lake Lily Park. Come by and see us. Dogs of all breeds are welcome! Howl-o-Ween Walk-a-thon and Canine Costume Contest: One of our favorite Halloween events, the Howl-O-Ween walk-a-thon is hosted by Franklin’s Friends and is the perfect opportunity to see lots of adorable pups in costume! Lots of treats for this trick-or-treat season. This event is on October 27 at Secret Lake Park in Casselberry. We hope to see you at one of these upcoming events around Orlando! Keep an eye on our Facebook page for more news on events as it arises. To view our full list of human grade dog food and treats, click here. It looks like fall is officially here! Everywhere, we’re seeing people and businesses trade in their beach towels and sunscreen for pumpkin spice lattes and scarves. Well - maybe not scarves here in Florida, but it’s undeniable that the air is starting to get a little more crisp, and the days are getting shorter. As October approaches, we’re getting ready for the holiday season to begins. It’s great for upset tummies. If your dog has ever had an upset stomach, your veterinarian may have recommended you to feed them some pumpkin puree from the can. Pumpkin is a particularly effective ingredient for dogs who have sensitive stomachs, making it a great addition for any dog who is transitioning from kibble to a raw diet. It’s full of fiber. Pumpkin is a miracle food for dogs, as it treats both diarrhea or upset and constipation. Pumpkin is full of fiber - nearly three grams per cup of puree. Substituting part of your dog’s diet with pumpkin is a great way to help them lose weight while still providing them with all the nutrients they need to live healthy lives. It’s an important source of beta-carotene. You may have heard of the benefits of beta carotene in your own diet; provided by foods like carrots, sweet potato, and spinach, it supports healthy vision and works as an antioxidant. The great news is that it does the same for your pup! Supporting healthy vision is so important for active dogs who like to spend time outside. Introducing a small amount of pumpkin to your dog’s daily diet is a tasty way to help them get all the nutrients they need to live healthy lives. It’s a good addition whether they’re eating kibble or living on a natural food diet! Order some of our peanut butter and pumpkin treats and see the difference for yourself. Visit our website to learn more. "Picked up another couple bags of Rocket's super-cool, super-clean, super-pure food yesterday from our friends at Pawsitively Pure. As you can see, he LOVES the food! He's also quite stylish in his bandana. ;-)We've certainly noticed a difference in his coat and skin since he began eating the Turkey and Vegetables Human Grade Food. The scabs are gone, he smells much better and he's happier. That makes us happy! Even though the fine folks that make Pawsitively Pure are right around the corner from us they can ship frozen food right to your door. Easy-Peasy! Go check 'em out and tell them RocketMan sent you. And, Yes, he really is that cute! :-) - Mommy, Daddy & Rocket <3"
We're so happy that Rocket has been experiencing better health and happier days since he made the switch to Pawsitively Pure! Ready to start your Pawsitively Pure journey? Browse our shop and get started! Noticing These 3 Symptoms in Your Dog? They May Have Food Allergies. As you probably know by now, your dog’s diet has a lot to do with their activity levels and overall well being. Food is your dog’s first source of energy and nutrition. It’s also their first source of irritants and pollutants. Often, your dog will let you know that they’ve eaten something they don’t like by vomiting or displaying other gastrointestinal distress. Sometimes, however, symptoms may show up differently than you’d expect. Constantly itchy skin. Itchiness is one of the most commonly cited symptoms of food allergies, usually accompanied by pink skin underneath. If your pup seems to itch without relief or is losing patches of hair due to too much scratching, there’s a good chance the cause is a food allergy - especially if over-the-counter shampoos and solutions don’t seem to work. Reddish-brown stains around the mouth and paws. Generally, these red patches can be attributed to yeast colonies, which are better able to grow at infection sites. These patches are often itchy and you may notice your dog licking its paws more than usual. Frequent ear infections. While dogs that are frequent swimmers are prone to swimmer’s ear, food allergens can also cause recurring infections in your furry friends. Check the ears for dark brown or black, stinky buildup. This, too, is usually caused by a yeast infection triggered by the appearance of an allergy. What’s the next step if you think your dog has a food allergy? The most reliable test is through an elimination diet, which can take about 4-6 months to complete. In a program like this, you’ll take your dog’s diet back down to the very basics and slowly reintroduce each ingredient to determine how it affects their overall wellness. As always, consult your veterinarian before going on a program such as this. Many pet parents find that their fur babies have healthier skin and coat after switching to a human-grade diet. Keeping your dogs on a simple, natural diet makes it easy to tell what ingredients work in harmony with their systems. Get human-grade dog food delivered to your door from Pawsitively Pure. Click here to browse our products. There’s nothing better than a big bowl of fresh, sweet berries to enjoy as a summertime snack! For years, blueberries have been touted as a superfood and enjoyed for their juicy sweetness and their health benefits. 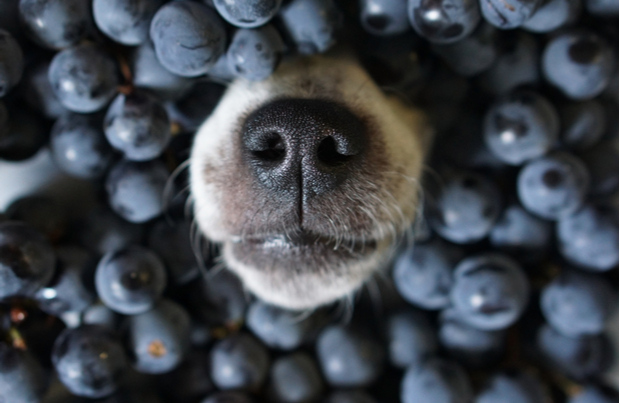 But did you know that blueberries pack a lot of awesome nutritional benefits for your dog, too? They help protect eyes. Older dogs in particular are susceptible to cataracts, especially if they’ve spent most of their time having fun in the sun. Studies have shown that blueberries help improve dogs’ nighttime vision as well as restoration of their visual acuity after exposure to glare. Keep your furry friend in good visual health for longer. They’re anti-carcinogenic. According to the Veterinary Cancer Society, cancer is the leading cause of death in 47% of dogs. Blueberries are full of a number of different compounds that help to prevent a variety of types of cancer, including colon cancer. Studies have even shown that the phenolic compounds in blueberries can cause cell death in cancerous cells. They’re great for the brain. Blueberries also contain a number of compounds that help support the brain’s function, especially later in life. They’re also great for puppies in that they provide nutrients shown to support spatial learning and memory, like Anthocyanin. Your old dog really can learn new tricks with the support of this tasty snack! We love blueberries as a tasty and healthy addition to your dog’s diet. When you choose human-grade food for your dogs, you want to be sure you’re getting the freshest natural ingredients. Pawsitively Pure Dog Food features all natural, organic products, good enough for you AND your dog to eat (but please leave the snacking to the pups!). To view our available products, click here. So you’ve read the blogs, you’ve seen the results, and you’re ready to get your own dogs started with natural, human-grade dog food. Congratulations! You’re on the way to a long life with a happy, energetic pup. Pet owners around the world have been turning toward whole foods as the best way to keep their furry friends satiated and healthy, in much the same way as they’ve been rethinking their own diets. Don’t get rid of the kibble just yet! The best way to start the transition to new food is by blending small portions of the new food into your pup’s usual bowl of food. At first, you’ll add just a handful; as time goes on, you’ll decrease the amount of your dog’s kibble and increase the human-grade food until you have a bowl full of nothing but Pawsitively Pure food! Don’t add additional new ingredients, if you can avoid it. Your dog’s stomach is very sensitive, so it’s best to take this transition one step at a time. If you introduce too much human-grade food too quickly, you might find your dog experiencing digestive issues or needing to go to the bathroom more often. Once your dog is fully transitioned, then you can try different recipes or new treats! Is your dog being a picky eater? Commercial kibble is often coated with animal fat, making it more appetizing and even addictive to dogs. Human-grade dog food strips away all the unnecessary additives, but it may take a little while for your dog to warm up to the idea. If you find your pup is being picky about the natural food, try adding a little bit of bone broth or a sprinkle of shredded cheese for an extra tasty incentive. The time it takes to transition your dog to human-grade dog food is worth all the enjoyment they’ll get out of life! We love hearing stories about how your dog is thriving on natural dog food. To find the right food for your pup, click here, or browse our Facebook page for more information! Enter your email address below to get the latest news and information on products, sales, and more.